Rabbi David Einhorn’s prayer book `Olat Tamid (lit. the perpetual sacrifice)…first penned in Germany, served as the model for the Union Prayer Book,….the prayer book of the American Reform movement for almost eight decades. It reflected what is now called “classical Reform,” eliminating prayers for the restoration of Zion, mentions of the messiah, and bodily resurrection of the dead, while diminishing mentions of Jewish chosenness and the like. Help to transcribe this prayerbook at German Wikisource. 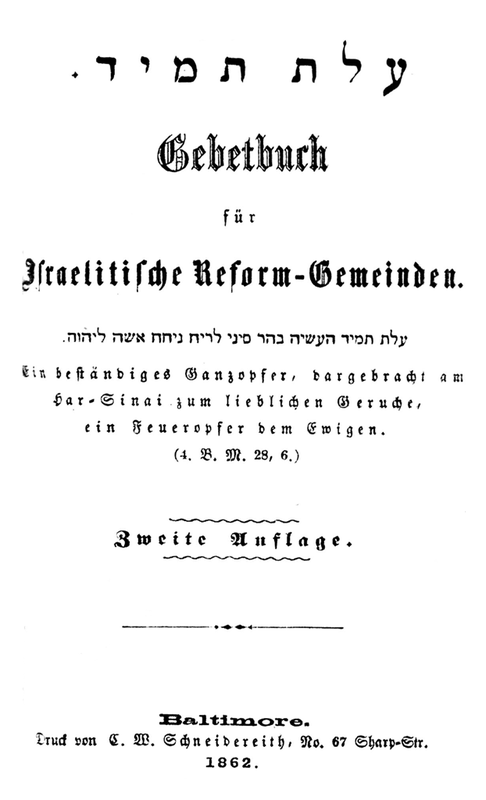 “עלת תמיד | Olath Tamid: Gebetbuch Für Israelitische Reform-Gemeinden, by David Einhorn (3rd German ed. 1862)” is shared by David Einhorn with a Creative Commons Attribution-ShareAlike 4.0 International copyleft license. Please reciprocate for any adaptation or redistribution of this work by (1) properly attributing the work to David Einhorn, (2) clearly indicating the date you accessed the resource and whether any changes have been made (and if so, please be in touch with us and leave a comment below so that we might note your adaptation or improvement), (3) providing a link back to this source, and (4) specifying the Creative Commons Attribution-ShareAlike (CC BY-SA) 4.0 International copyleft license under which this work was shared.